Due to popular demand, we are pleased to inform all our clients that we have added new gifts to our existing Cook & Exchange Gift Scheme. Have a look and keep on saving your proof of purchase found on all Lamb Brand products to exchange with these useful and handy gifts! - 500 proof of purchase: Our grand gifts to our most loyal clients! We are giving out a set of 18-piece porcelain set from La Mediterranea collection. Each set includes 6 lunch plates, 6 soup bowls and 6 side plates. There are different designs to choose from. For the same amount of points, you can also choose a set consisting of 3 pieces including a pot, saucepan and a pan! - 275 proof of purchase: Who would not want a good sharp knife set in the kitchen? Exchange your packets with the Quttin 13-piece Knife set with a wooden block. - 270 proof of purchase: Exchange your Lamb Brand packets with these high-quality Swiss Line set of 2 pans. These pans are marble coated, highly durable and scratch resistant. Being light-weight and quick in heat distribution, this set is also ideal for induction hobs. - 250 proof of purchase: The perfect set for a relaxed evening with your family or friends. Get this set consisting of 6 wine glasses, 3 bowls, and 6 small appetizer bowls. Its great to serve small appetizers and dips, and of course a good glass of wine, when in good company. - 230 proof of purchase: One of the new additions to Cook & Exchange Gift Scheme! Prepare your favourite stir-fry or any other dish with a high quality wok. The depth of this wok allows one to mix all ingredients with good comfort. - 160 proof of purchase: A 7-piece glass bowls set can be yours. This set consists of a large salad serving bowl and 6 smaller bowls. - 150 proof of purchase: Start grilling like a pro with Lamb Brand! This 7-piece BBQ Apron and Utensil set is ideal for outdoor cooking. Featuring a variety of BBQ tools, this handsome set comes complete with its very own custom apron so cooking tools are always within reach. This set includes a spatula, fork, tongs, oven mitten, salt and pepper shakers. The apron comes with adjustable locking fastener and built-in storage pockets. All tools come in stainless steel with extra long solid wood handles. On the other hand, if you are not a BBQ fan, you can exchange your packets with a voucher worth €10.00 in any Lamb Brand Products! - 140 proof of purchase: Life is all about fun and celebrations! Exchange your Lamb Brand packets with a €10.00 voucher from Bow and Ribbon. Bow and Ribbon is situated in Naxxar and one may find a whole world of gifts, home decorations, souvenirs, party items and more. With the same amount of points, you can also get a fantastic 2-piece set of Square pie dishes, which are perfect for baking your favourite baked pasta or a cheesy Quiche! - 130 proof of purchase: A set of 2 round glass tart dishes. One having a diameter of 32cm and another of 26cm. These are ideal for baking your favourite tart. - 120 proof of purchase: Carry your BBQ tools anywhere you want. Get this cool 4 piece BBQ carry case ideal for the Summer months and also during the Winter Days. This black BBQ bag comes with a set of 3 stainless steel utensil set consisting of a spatula, a fork, a pair of tongs and also an oven mitten. This BBQ carry case is ideal to carry around and measures 39 x 21 x 4 cm. - 100 proof of purchase: Add a splash of colour to your kitchen with a nice colourful 5-piece stainless steel knife set. This set includes a bread knife, two chef’s knives, utility knife and paring knife. With the same amount of points, you can also get a 6 piece colourful appetizer/ice-cream bowl set. 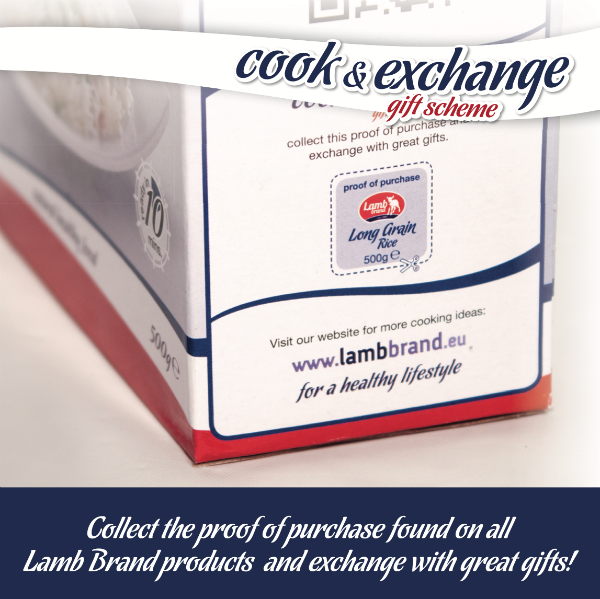 - 75 proof of purchase: Exchange your Lamb Brand packets with more Lamb Brand products. With just a few points, you can exchange these with a voucher worth €5.00 in different Lamb Brand products. For the same amount, you can also exchange your packets with a useful colourful 5-piece kitchen helper. - 70 proof of purchase: Prepare your favourite salad or any other meal, and maintain its freshness with these lovely set of 5 glass bowls, which come with plastic lids. - 60 proof of purchase: A must-have colourful Trio Bowl set with wooden tray. These bowls are ideal to serve any dips, crackers or snacks. In addition to these, you can also exchange the same amount of packets with a nice colourful 4-piece kitchen set, consisting of a holder with 2 blade knives, vegetable peeler and a bottle opener. - 50 proof of purchase: Get a Special Edition Tin Box containing 50 recipes and with 10 proof of purchase you can get a pack of 4 recipes to be added to your recipe box. May we remind you that in total we have 74 recipes for you to collect! 50 found in the recipe box and another six packs with four recipes each to add to your collection. - 35 proof of purchase: With such a small amount of proof of purchase you can choose this useful measuring set including measuring jug and cups. The proof of purchase can be redeemed at our office situated in 30, New Street Qormi and we are open from Monday to Friday between 8.30am and 1.30pm. Otherwise you can enclose your proof of purchase in an envelope, with your name, mobile number and the gift required written on, hand it over to your local store and we will deliver the gift one to two weeks after. 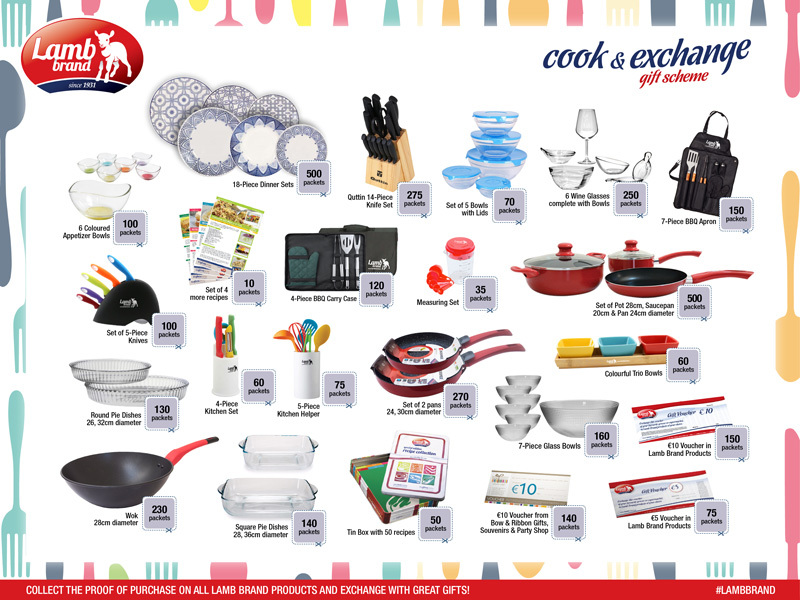 Lamb Brand’s Cook & Exchange Gift Scheme was created to reward our loyal customers for choosing our brand and is also part of our waste management program. Each and every Lamb Brand product carries the value of 1 point, we have kept the points in such a way for easy counting and logistic reasons. Some might not agree and think its unfair, however Lamb Brand offers a vast variety of products which compensate each other. The Loyalty Scheme is designed in a way that the gifts do not carry thousands of points so this makes it easier for our loyal customers to save up the number of points in a short span of time and won't take long to exchange their proofs of purchase with great gifts.